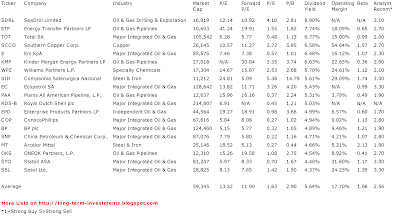 Large Capitalized Basic Material Dividend Stocks With Highest Yield Researched By Dividend Yield - Stock, Capital, Investment. It’s very important to know what yields are traded within a sector or industry in order to compare risks and premiums. 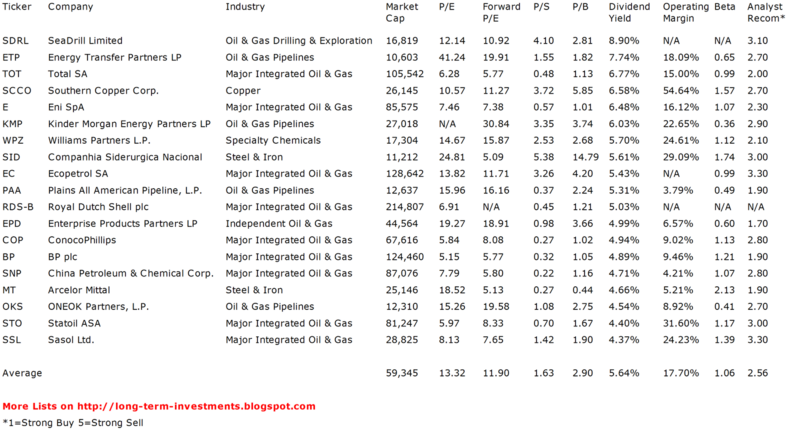 I made a screen of the best yielding large capitalized basic material stocks. 88 companies from the sector have a market capitalization over USD 10 billion and 81 of them pay dividends. Below, I listed all stocks with a yield over 4 percent. The best represented industry is the major integrated oil and gas industry with nine companies. 11 stocks from the results are high yields and seven are recommended to buy. BP (NYSE:BP) has a market capitalization of $124.46 billion. The company employs 83,400 people, generates revenues of $386,463.00 million and has a net income of $26,097.00 million. The firm’s earnings before interest, taxes, depreciation and amortization (EBITDA) amounts to $51,908.00 million. Because of these figures, the EBITDA margin is 13.43 percent (operating margin 10.30 percent and the net profit margin finally 6.75 percent). Financial Analysis: The total debt representing 15.09 percent of the company’s assets and the total debt in relation to the equity amounts to 39.67 percent. Due to the financial situation, a return on equity of 24.89 percent was realized. Twelve trailing months earnings per share reached a value of $7.63. Last fiscal year, the company paid $1.68 in form of dividends to shareholders. Market Valuation: Here are the price ratios of the company: The P/E ratio is 5.15, P/S ratio 0.33 and P/B ratio 1.15. Dividend Yield: 4.75 percent. The beta ratio is 1.21. ArcelorMittal (NYSE:MT) has a market capitalization of $24.95 billion. The company employs 261,000 people, generates revenues of $93,973.00 million and has a net income of $1,798.00 million. The firm’s earnings before interest, taxes, depreciation and amortization (EBITDA) amounts to $9,580.00 million. Because of these figures, the EBITDA margin is 10.19 percent (operating margin 5.21 percent and the net profit margin finally 1.91 percent). Financial Analysis: The total debt representing 21.68 percent of the company’s assets and the total debt in relation to the equity amounts to 46.60 percent. Due to the financial situation, a return on equity of 3.03 percent was realized. Twelve trailing months earnings per share reached a value of $0.87. Last fiscal year, the company paid $0.75 in form of dividends to shareholders. Market Valuation: Here are the price ratios of the company: The P/E ratio is 18.42, P/S ratio 0.27 and P/B ratio 0.45. Dividend Yield: 4.59 percent. The beta ratio is 2.13. Plains All American Pipelines (NYSE:PAA) has a market capitalization of $12.69 billion. The company employs 3,800 people, generates revenues of $34,275.00 million and has a net income of $994.00 million. The firm’s earnings before interest, taxes, depreciation and amortization (EBITDA) amounts to $1,530.00 million. Because of these figures, the EBITDA margin is 4.46 percent (operating margin 3.79 percent and the net profit margin finally 2.90 percent). Financial Analysis: The total debt representing 33.80 percent of the company’s assets and the total debt in relation to the equity amounts to 95.39 percent. Due to the financial situation, a return on equity of 15.47 percent was realized. Twelve trailing months earnings per share reached a value of $5.01. Last fiscal year, the company paid $3.91 in form of dividends to shareholders. Market Valuation: Here are the price ratios of the company: The P/E ratio is 15.70, P/S ratio 0.37 and P/B ratio 2.34. Dividend Yield: 5.29 percent. The beta ratio is 0.49. Take a closer look at the full table of large cap basic material stocks with best yields. The average price to earnings ratio (P/E ratio) amounts to 13.32 and forward P/E ratio is 11.90. The dividend yield has a value of 5.64 percent. Price to book ratio is 2.90 and price to sales ratio 1.63. The operating margin amounts to 17.70 percent.